Autumn is starting to bite here in the UK – the evenings are drawing in and the nights are getting colder. Here at Tundra we’re hoping to spend the cosy winter nights working on the PC Steam version of the game. Today we’re launching our Greenlight campaign! The gameplay in the PC version will be the same as mobile – we don’t plan on changing anything, at least initially. However we are planning on upping the graphics for the big screen and many of these changes should carry across into the mobile versions. Similarly Steam should mean a lot more people playing online and we’ll look at improving the multiplayer experience for everyone. More people playing the game will help us make new updates for all platforms. We also want to stress that the Steam version is planned to be paid only – no microtransactions or adverts. It’s going to be pay once. We’d appreciate your support – if you can vote for us and write some nice comments it will help get us through and we can get the kettle on! The game focuses on you as a god battling other gods indirectly for souls and land on a fertile planet. Your ultimate aim is to take over all regions of the planet and wipe out your enemies. At the start you have the choice of your starting region; taking into account its strategic position and its production value. High production regions will be quicker to increase their armies. You can choose a small island and enemies will not be able to reach you until their technology is sufficient, but you may limit the space you can spread into. Once settled, your armies will start to increase and allow you to direct units to attack neighbouring regions. 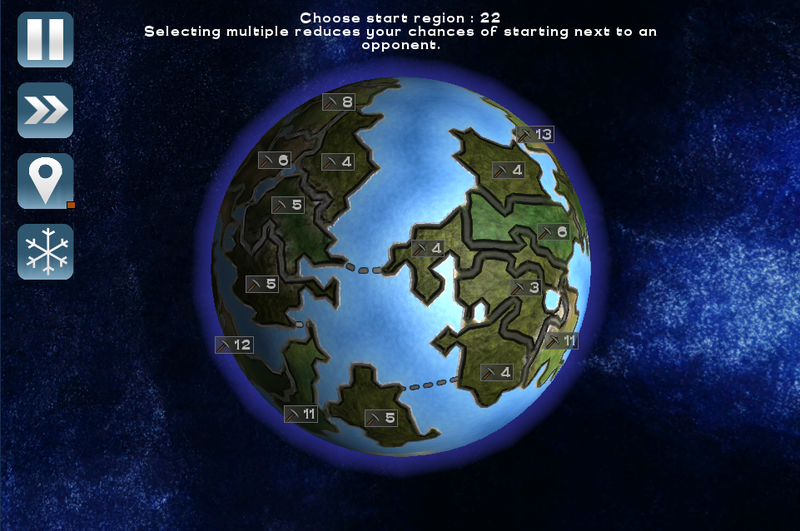 Initially a lot of the game regions will be neutral and simple to conquer. But as civs run out of space, they will increasingly attack each other. Attacking is a case of tapping a region and tapping where you wish to attack. Armies will be sent out to the selected region and battle will ensue! If you are able to reduce the defending armies to zero that region becomes part of your civilization and will start producing friendly armies. Your scientists are constantly at work to produce bigger and better technology. 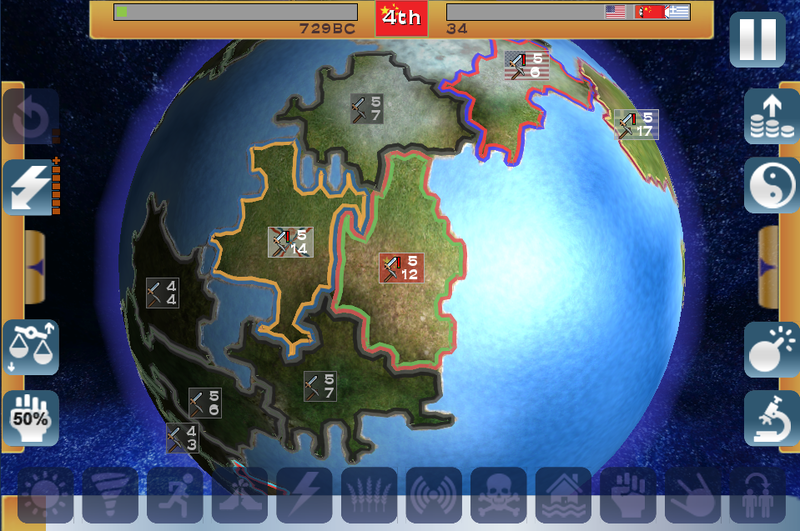 As you progress through each technological age your armies become increasingly more powerful. Across the bottom of the screen is the mana bar. Mana allows you to unleash miracles on the planet, the more mana you have, the more miracles available. More destructive miracles require more mana. As the bar fills the miracle icons will become available to drag onto the planet. The bar fills faster the more followers you have praising you. Most miracles are destructive natural events – such as earthquakes, hurricanes and volcanoes. 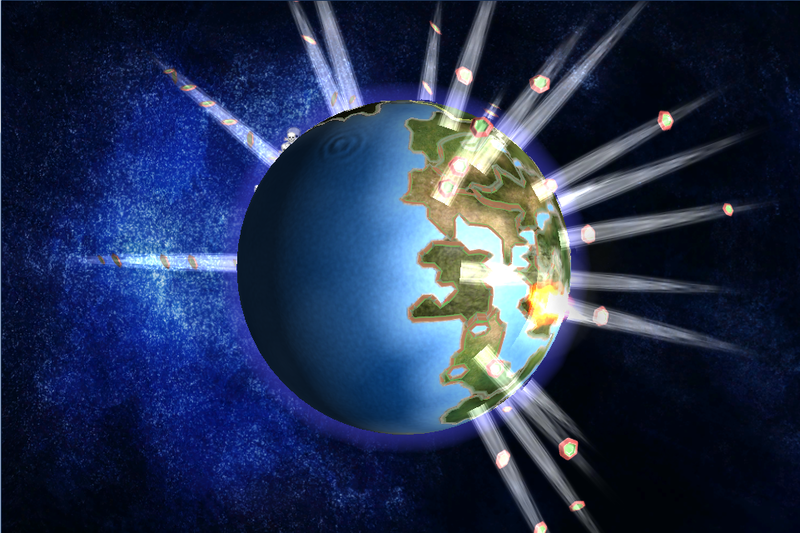 The meteor strike is the most destructive and will wipe out most armies in its impact zone. Other miracles will affect regions through cowardice, disease and famine. The right bar is the production balance options. 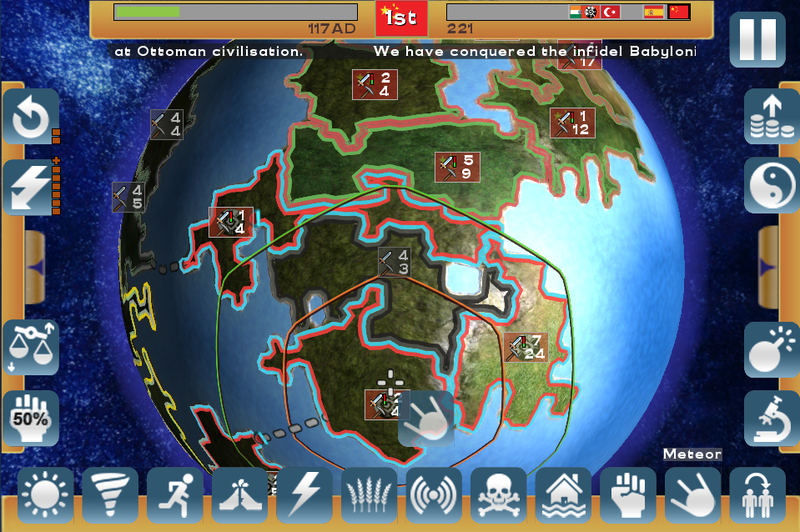 You have the choice of directing production to one of four options – religion to boost your mana creation, military to concentrate on army strength, science to advance quicker in technology or food to increase the number of armies being produced. With nothing selected production will be balanced across all four. 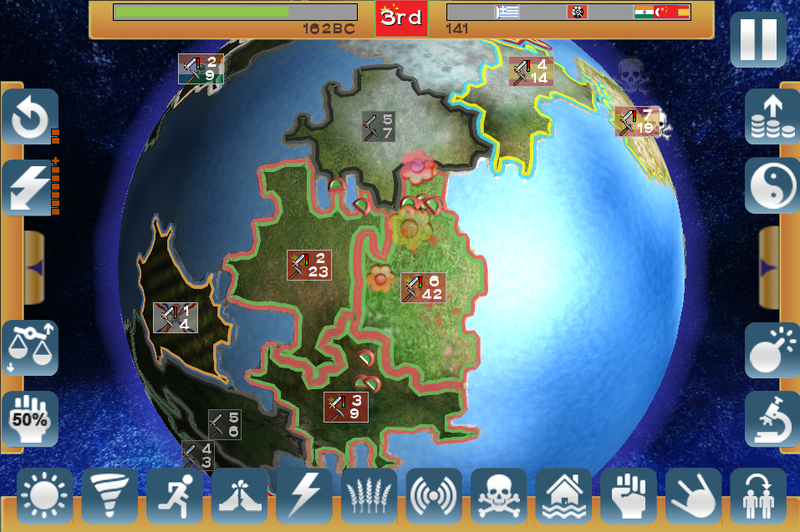 The left bar gives further game options – power-ups to boost your powers, as well as a button to balance your armies across all regions and another to choose how many units you want to deploy each time you attack. 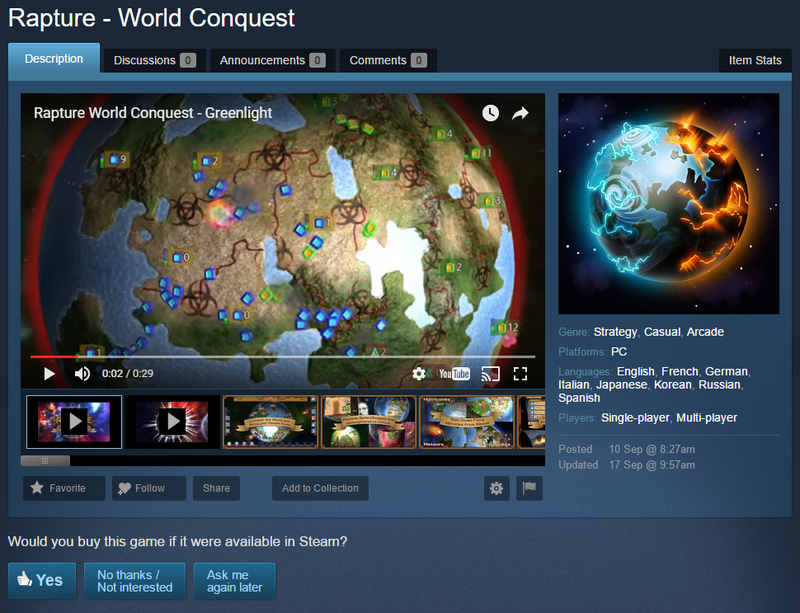 Finally the top bar provides game information to see how you are progressing in your world conquest. Your game progresses as you battle for regions; directing your armies and raining down miracles. Your armies may be overwhelmed in which case your remaining followers will be vanquished to hell. If you overcome your enemies and dominate the globe you can then rapture your followers up to your heavenly realm in beams of warm light blue.